Many of you are changing your medicine cabinets to a more natural approach. 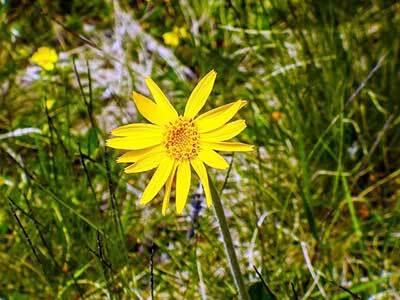 One natural medicine that needs to be included is Arnica Montana. This is a natural first aid for trauma. It’s heavily used in my house, has saved trips to the emergency room and decreased emotional upset. It helps to relieve discomfort with anything associated with trauma like stubbing a toe, falling, head injury, twisted ankle, sprains, aches from overuse of muscles, cuts, bruises, scrapped knee, even intentional trauma like surgery. 2-3 pellets in mouth and let dissolve. It should be placed under the tongue for best absorption. It’s also is best used as close to the incident as possible. Arnica also comes in a cream for topical use which is great for sore muscles and can be used in conjunction with the oral pellets. With the use of Arnica, many patients are able to avoid pain medications entirely. It is non-addictive and quickens healing. I carry it in my purse in case of a car accident or for my children who get sports injuries frequently. You will be amazed at how effective these little pellets are at reducing pain.